The setup for Magnetica is well conceived and well implemented. The demo gives you 5-10 minutes of play, assuming you beat everything the first time through, but it give you a good taste of exactly what the game's about. The Versus Mode is also well done. The ability to unlock the extra course designs gives enough incentive to keep playing and the items make the game feel like more of an interactive two-person game rather than a game two people just so happen to be playing, though some purists will undoubtedly disagree. Because of the massive amount of information being downloaded, the Versus Mode download takes approximately one minute and the Demo Mode takes approxiamtely one minute and twenty seconds. The fields on the menus are learge with sufficient buffer space. If you're paying any attention at all, you won't accidentally tap the wrong menun option. The "Versus" option is easy to find right on the main menu and the Demo Mode is under "Options". Because this game is part of the G Touch Generations line of games, everything can be done using the stylus and the touch screen. Just pretend those buttons don't exist. Targeting is very responsive when you're throwing the marble, but make sure you're focused. The marble will go wherfe you throw it, but if you're even a little off, the result will be too. This was, of course, done intentionally. The game will give you a little leeway, but not much, and it shouldn't. That is the point of the game, after all. Welcome to the world of clacking! The sound effects are done well, as is the sound overall. The graphics are, well, marbles. Nothing extemely detailed, but why would there be? The demo mode is short, but well set up, responsive, and a sampling that's true to the main single-player game. The versus mode is even better, having different (but unlockable) course designs. Unfortunately, versus is only for two players at a time. Just send your friends demos while they're waiting their turn. Guests (a.k.a. "downloaders" or "joined players") can even use their rumble packs for the game, not just the host!! There are a lot of heavily-addictive puzzle games for the Nintendo DS. Magnetica is one of them. You may have known the game as Actionloop, PuzzLoop, Ballistic, or Luxor, but like many other puzzle games, the DS gives it a whole new life. The abilities provided by a touch screen interface make reaction-based puzzle games feel more interactive, more personal, and (where appropriate) more frantic (I'm excluding crossword puzzles, which aren't reaction-based). 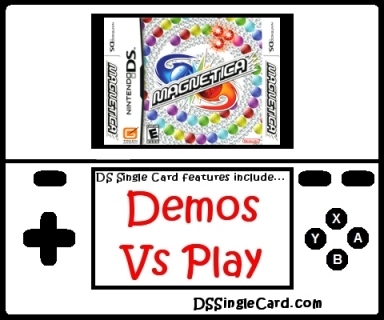 Like many other puzzle games, Magnetica (even in Versus Mode in Single-Card Download) even has an endless option so, when you are evenly matched up with an opponent, the game doesn't have to end early if both participants want to keep going. It's a fun game. Like every game ever made, it's not for everybody, but it is something (just about) any puzzle game enthusiast will enjoy. Multiple Demo options featuring different boards and quests. 4-Player Versus Mode where activated items can effect either one random opponent or all opponents simultaneously, depending on the item & its level.